ERIS, an enterprise resource information solution, provides a real-time information integration platform for law enforcement, facility managers, and emergency responders providing users with broad situational awareness and tactical information about critical assets including buildings, technical environments, and infrastructure. ERIS uses an innovative approach to safety and security by applying robust Enterprise GIS technology to sensors with both spatial and non-spatial data. 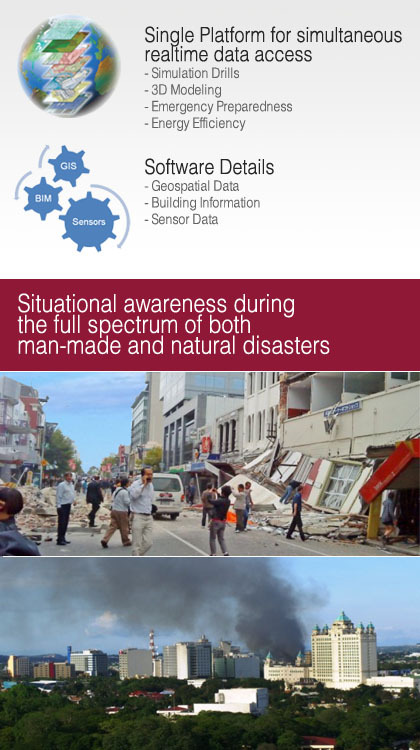 ERIS supports the decision-making process before, during, and after incidents and serves the need of public safety organizations in their effort to safeguard human lives by providing real-time data that enhances an organization’s ability to make critical decisions when faced with time sensitive conditions. ERIS is the single solution for security management, emergency response, and domain awareness. Additionally, ERIS can be configured to support facility operations & maintenance, energy management, and compliance management..
To provide users with an ability to react more quickly and efficiently to events, ERIS displays a real-time Common Operating Picture (COP) for Enterprise (facility) information in a 2-Dimensional (2D) and a 3-Dimensional (3D) display. With this approach role-based operators are equipped with simple and effective situational awareness decision-making tools that enhance communication during an incident. Critical data from these events are filtered to users through a single web-enabled interface, presenting a clear, geospatially-based picture of monitored events. The information disseminated using ERIS can integrate directly with mass notification systems, relaying specific and direct details to responders for immediate action. A key advantage ERIS provides is that it employs an “open platform” with a “pluggable provider architecture” which reduces the complexity and variety of legacy systems, eliminating the inherent problems associated with integrating proprietary systems, thus enabling quick and efficient situational response.